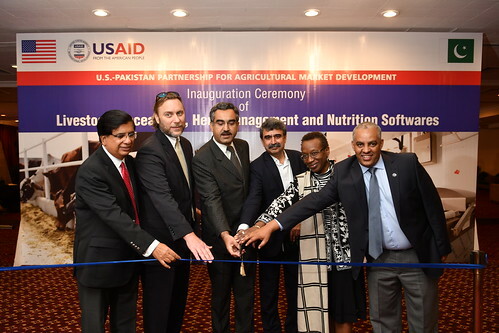 Lahore, April 18, 2019 – The U.S.-Pakistan Partnership for Agricultural Market Development (AMD) announced the launch of a new software package to expand Pakistani meat exporters’ access to global markets. The state-of-the-art software will track animals’ origins and where meat is processed, which will help prevent the spread of animal diseases and enhance biosecurity. The new software package also will help farmers formulate economical feed rations with an optimal mix of nutrients, which will lower production costs. This is the first time such a software package will be used in Pakistan. The USAID-funded AMD project provides integrated support to the livestock sector through grants, training, and technical assistance to upgrade equipment, introduce innovative meat cuts and packing technology, and support Pakistani producers and exporters in meeting international food standards. “Through projects like AMD, USAID is supporting equipment upgrades and other initiatives to improve product quality, boost exports, streamline supply chains, and bolster Pakistani exporters’ competitiveness and profitability,” said USAID Provincial Director for Punjab Kevin Sharp. USAID launched the AMD project in 2015 to improve the ability of Pakistan’s commercial agriculture and livestock sectors to compete in international and national markets for meat, high-value and off-season vegetables, mangoes, and citrus. WASHINGTON, D.C. – Cultivating New Frontiers in Agriculture (CNFA), an international agricultural development organization, announced that Oikocredit, a social impact investor, and the Maximizing Opportunities in Cocoa Activity (MOCA) project, implemented by CNFA, signed a memorandum of understanding (MoU) to strengthen cocoa cooperatives’ capacities in financial management and increase their potential for sustainable development. MOCA, funded through the U.S. Department of Agriculture’s Food for Progress program, and Oikocredit signed the MoU on April 3 in Méaguy, in the Soubré department of western Côte d’Ivoire. Côte d’Ivoire is the world’s biggest producer of cacao beans, responsible for an estimated 40 percent of annual global production. However, many farmers live in poverty due to low cocoa productivity combined with full dependency on cacao production for their household income. The partnership between MOCA and Oikocredit will offer better opportunities for MOCA-selected cooperatives to develop an entrepreneurial approach to cocoa farming by diversifying their sources of income and accessing appropriate financial services. Together, Oikocredit and MOCA have already led three regional workshops in February 2019 to provide information surrounding obstacles to loan access for cocoa cooperatives and assessing the understanding of risk management and bank requirements among cocoa producers. To formalize the collaboration, MOCA’s Chief of Party and Program Director, Marc Steen and M. Camara Sauveur, welcomed a delegation from Oikocredit composed of Bart van Eyk, Director of Investments; Laura Pool, Director of Finance and Risk; Hans Perk, Regional Director Africa; and Solène Prince-Agbodjan, Investment Officer Agriculture. They met with MOCA-selected cooperatives in Méaguy and discussed the main challenges in the Ivorian cocoa sector and opportunities to address them. The signing ceremony for the MoU was held during the delegation’s visit. MOCA provides capacity building, training and other support services to Côte d’Ivoire’s cocoa producers, cooperatives and exporters in order to boost stakeholder productivity and efficiency, improve farm incomes, and increase the supply of high-quality cacao beans. Oikocredit supports smallholder farmers by providing access to loans, equity investments, and capacity building for agricultural cooperatives, producers, processors, and distributors that generate high economic and social impact for smallholder farmers. “At Oikocredit we believe that social impact finance and capacity building are among the most effective tools for reducing poverty. 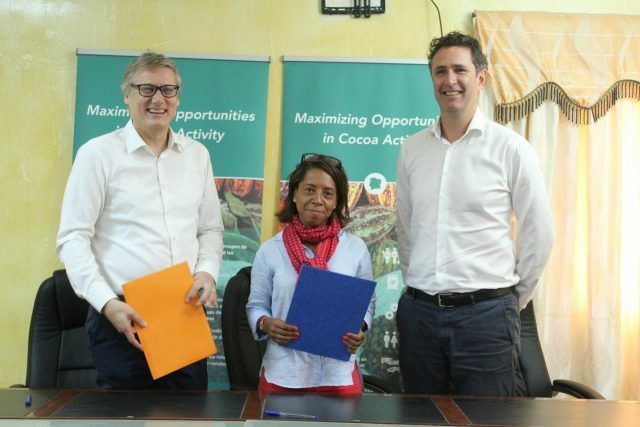 We look forward to collaborating with MOCA on strengthening our support of Côte d’Ivoire’s cocoa cooperatives and furthering our work towards improving livelihoods for Ivorian smallholders,” said Hans Perk, Oikocredit’s Regional Director Africa. CNFA: Cultivating New Frontiers in Agriculture is an international agricultural development organization that specializes in the design and implementation of sustainable, enterprise-based agricultural initiatives. We work with businesses, foundations, governments and communities to build customized local and global partnerships that meet the world’s growing demand for food. Since our inception in 1985, we have designed and implemented enterprise-based, agricultural development initiatives to facilitate market access, enhance agribusiness competitiveness, increase productivity, and improve access to inputs and financing in 45 countries around the world. Oikocredit: Social impact investor and worldwide cooperative Oikocredit has over 40 years’ experience funding organizations active in financial inclusion, agriculture and renewable energy. Oikocredit’s loans, equity investments and capacity building aim to enable people on low incomes in Africa, Asia and Latin America to sustainably improve their living standards. Oikocredit finances 684 partners, with total outstanding capital of € 1,046.6 million at December 2018. Oikocredit at communication@oikocredit.org or visit www.oikocredit.coop. Abuja – Under a new contract with Cultivating New Frontiers in Agriculture (CNFA), an international agricultural development organization, the U.S. Agency for International Development (USAID) recently launched the new Feed the Future Nigeria Agribusiness Investment Activity. This activity aims to help Nigeria develop and strengthen a more business-enabling environment through promotion of private-sector investment in agriculture. Through CNFA, USAID will work to improve the ease of doing business in the agricultural sector, broaden access to finance by mitigating the credit risks of agribusinesses, and promote investment opportunities for agribusinesses to expand and scale up operations. On November 19, 2018, leaders in the public and private sector, including U.S. Embassy Chargé d’Affaires, Ambassador Ross Wilson; USAID Mission Director, Peter Wiebler; Deputy Minister of Environmental Protection and Agriculture, Nodar Kereselidze, and leading Georgian agribusinesses convened to announce the launch of the United States Agency for International Development (USAID) Agriculture Program. This new five-year program, implemented by CNFA (Cultivating New Frontiers in Agriculture), an international agriculture development organization, will work closely with the Georgian Government and Georgia’s agribusiness leaders to create more rural jobs, improve rural livelihoods and advance sustainable economic growth and development in Georgia. The program will mobilize past USAID partners and prominent Georgian agribusinesses to share the knowledge and skills they have acquired with new participants of the program. Technical assistance will be accompanied by co-financing targeting micro, small, and medium enterprises as well as cooperatives to address constraints in the availability of planting materials, production, post-harvest handling, processing, and market access. The USAID Agriculture Program plans to create 3,000 new jobs, increase sales by 60 million USD and leverage over 7 million USD of increased investments from the private sector over the course of the five-year project. WASHINGTON, D.C.: CNFA, Cultivating New Frontiers in Agriculture, an international agricultural development organization, announced that it was awarded a five-year, $12.25 million cooperative agreement from the U.S. Agency for International Development (USAID) to implement Farmer-to-Farmer (F2F) Programs in Southern Africa and Moldova. USAID administers the U.S. foreign assistance program providing economic and humanitarian assistance in more than 80 countries worldwide. CNFA has 20 years of experience in implementing USAID F2F Programs, which connect farmers, agribusinesses and agriculture organizations with U.S. volunteer technical experts who provide market-driven solutions designed to boost agricultural productivity and incomes. Over the past two decades, CNFA has fielded more than 2,900 F2F volunteers in 24 countries, most recently in Malawi, Mozambique and Angola. Under the new award, CNFA will select and field volunteer experts tasked with supporting the production, processing and marketing of products in the aquaculture, horticulture, legume, livestock and rice value chains in Madagascar, Malawi, Mozambique, Zambia and Zimbabwe in Southern Africa, and in Moldova in Eastern Europe. Under the F2F program, CNFA engages the farming community, private sector, universities and other stakeholders to recruit skilled agricultural and business experts, who then use their technical expertise to help program beneficiaries create and implement market-driven solutions that boost productivity and economic outcomes. By improving livelihoods, F2F programs also encourage social stability and reduce the risk of conflict. CNFA also announced the appointment of agriculture and agribusiness expert Dr. Marjatta Eilittä to serve as Program Director for the new five-year project. In her new role, Eilittä will work closely with senior agricultural experts and program managers who support the value chains in their respective countries to ensure successful implementation of the program in each country. Eilittä previously served with the University of Florida’s Feed the Future Innovation Lab for Livestock Systems funded by USAID. Prior to that, she provided financial and technical oversight for a $43 million USAID-funded project serving several West African countries. Over the course of the five-year award, CNFA will design and conduct 420 volunteer assignments supporting 263 hosts across the six beneficiary countries. Plans call for the volunteer assignments to reach 80,741 beneficiaries through formal, on-the-job-training. Expected impacts over the term of the program include an estimated $1.4 million increase in beneficiary net incomes, and a projected $46.7 million in sales by the hosts. WASHINGTON, D.C.—Cultivating New Frontiers in Agriculture (CNFA), an international agricultural development organization, announced that Côte d’Ivoire’s Agence Nationale d’Appui au Développement Rural (ANADER) has entered into a partnership with Maximizing Opportunities in Cocoa Activity (MOCA), a three-year, CNFA-implemented initiative to strengthen Côte d’Ivoire’s cocoa sector. 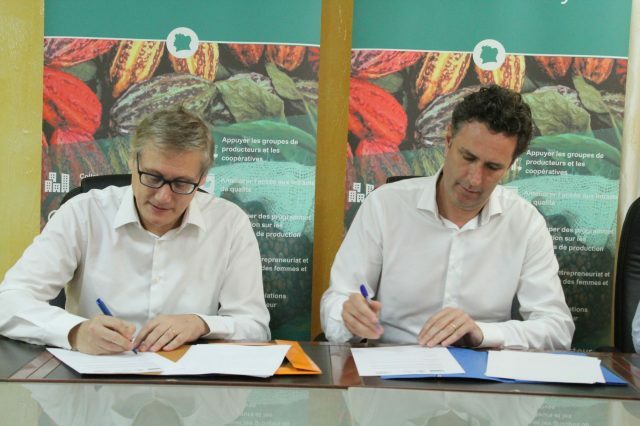 Under the new agreement, signed Sept. 22 by MOCA Chief of Party Marc Steen and ANADER CEO Dr. Sidiki Cisse, the organizations will collaborate to improve the efficiency of Côte d’Ivoire’s cocoa value chain and bolster the capacity of the country’s cocoa stakeholders. MOCA, funded by the U.S. Department of Agriculture’s Food for Progress program and implemented by CNFA, works to increase the quality and availability of the production and inputs, improve harvesting and post-harvest handling, facilitate trade relations, and strengthen producers to better meet the international market demand. ANADER works to improve the professionalism of farmers and agricultural organizations, providing training and consultation to farmers using tools and programs designed to ensure sustainable and controlled development. Project activities will focus on regions where ANADER has a local presence, including the Nawa, Haut-Sassandra and Indénié-Duablin cocoa-producing regions.